So, I really do love love the Toy Society--it's that whole random acts of kindness thing. Having experienced some random acts of kindness myself, firsthand, at some critical moments in my life--well, I just really believe in the importance of doing nice things for perfect strangers, with no expectations of gaining anything in return. It's good for the world to do those things--and you never know how important the seemingly small thing you are doing might be to someone else. And that, for me, is the allure of the Toy Society. Random giving of handmade toys to someone you do not know in exchange for nothing--not even the knowledge of who will end up with your creation. Of course, there is always the anticipation too of waiting to see who picked up your toy and where it is now and the new story that begins to spin itself around that toy as it settles into the arms of its new owner. And some of the stories are downright heart-warming or even fateful feeling--like this one where someone found a toy and upon returning home learned her friend's daughter had just fallen from an upper story window and was now in the intensive care--guess whose comforting companion that little toy became? So, yeah, I believe in the Toy Society and that it can and does have a positive impact on the world in its own little way--which is why I have committed to making and doing one drop every month this year for the Toy Society. It is actually a group effort--I make the toy, and Mr Beeper does the drop itself for me, selecting the location and taking the photos...so, let me share with you the doll I made and dropped for the month of January. 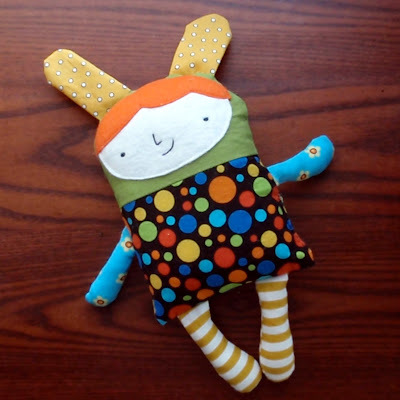 It is another Polly doll by Carly Schwerdt of Nest Studio, found in the Softies book. And that is another thing: I decided that I wanted to not make any of my own designs for these monthly toy drops--I want to only make the designs of other plush artists. Just because I like other people's designs and want to share them with all of you and because I like to make new plushies I have never made before and because I want to. So there. 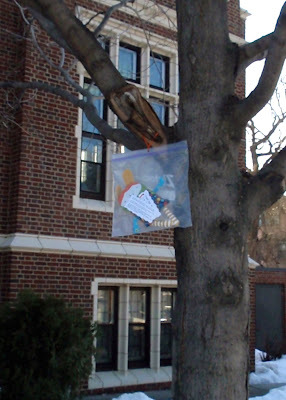 This drop was made in my neighborhood--just outside Hosmer library on 36th street in Minneapolis. This is a library we visit about every week. It is a classic old-school-style brick building, with a big wonderful fireplace inside and dark wood paneling and is always filled with the diversity of our neighborhood--it is a place loved by our whole family and our community. You can read more about the drop itself here on the Toy Society's website--as well as read about all the other toy drops that happen every day...so, what about you? When are you going to make a toy and drop it for the Toy Society? Hi, I've just discovered your blog and think its gorgeous. Thanks for the post about the Toy Society, I just love the idea of it!I think I will have to sign up to be a part of it straight away! Thanks so much for your kind words. I am glad you like the blog--it is hard to know sometimes without comments like yours whether what I write is useful to anyone but me...but I am glad you are inspired by the Toy Society...it is a great organization.